Please help us keep Asiyah Women’s Center running. Your donations will rebuild lives. 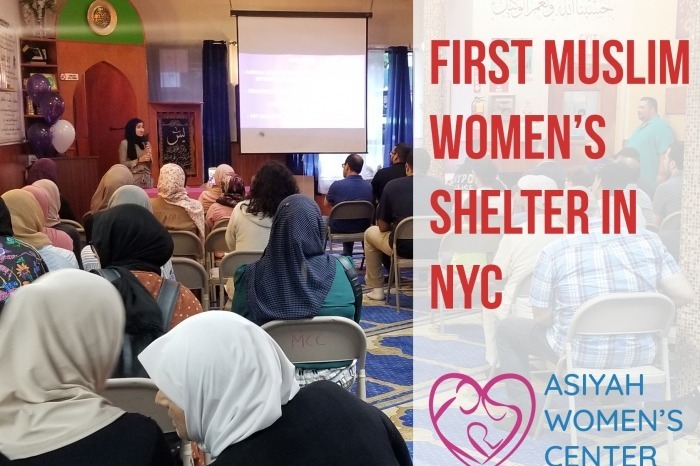 Opened: July - 2018 ￼ The Asiyah Women’s Center, a project of Muslims Giving Back, is the first Muslim women’s family emergency shelter in New York City. Our mission is to provide temporary housing for victims of domestic violence and women facing eviction, and/or homelessness. By connecting under resourced women in our community to job opportunities, a range of mental health and medical services, permanent housing facilities, health insurance and legal assistance, we hope to empower women to get back on their feet and overcome their deeply traumatic personal circumstances. The Prophet Muhammad ﷺ said “Your Heaven lies under the feet of your Mother” (Ahmad, Nasai). Since opened 3 months ago, we have had over 20+ residents and children living in our center. Many have transitioned to other long term shelters and homes and are on track to get back on their feet. ￼ Brooklyn Borough President Eric Adams has been a tremendous supporter of our center as well as local officials and the NYPD. ￼￼ Our Center: 6 FULLY furnished Bedrooms, 2 full bathrooms, living room, and a kitchen. What we do Our center can house up to twenty women and children and is run by a trained female staff and a group of dedicated volunteers. The center ensures that all guests are cared for and are on a path to rebuild their lives. This will be done through: -Access to a safe, secure and comfortable living space -Counseling and therapy services -Check ups provided by physicians and licensed mental health professionals -Employment assistance -Fully stocked pantry of food and toiletries -Our comprehensive security plan includes surveillance cameras, staff members on site at all hours, and a close relationship with the 72nd street police precinct. We ensure the complete safety of our residents. Why we do it New York City has nearly 800,000 Muslims yet currently there are no emergency housing centers for Muslim women. We receive many cases of Muslim revert women who are rejected by their families and cast out to fend for themselves. Having nowhere to go, they sleep in mosques, on the streets, or in shelters that don’t accommodate for their religious beliefs. We also get cases of women who are in abusive marriages or abandoned by their husbands and women from overseas who do not speak English, have no job skills and are forced to assume the role of a household provider. Many refugees are also facing hardship and evictions and we MUST as a community have a solution for such emergency situations. There is a dire need for emergency housing for Muslim women. Our goal is to enable families to have a real home - a place where families can raise their children in safety, peace, and dignity. We absolutely believe that every woman and child who comes through our doors has the potential to reach for and attain a better life for themselves and their children. Costs: Rent: $3,100 a month (includes utilities) = $37,200 for 1 Year Construction: $15,000 (6 bedrooms, 2 bathrooms, security system) Furniture: $7,000 (10 bunk beds and mattresses, sofa, blankets, sheets, pillows, closets, dressers, etc...) TOTAL GOAL: $59,200. ALL DONATIONS ARE ZAKAT AND TAX DEDUCTIBLE. Thank you for the Amazing support! We are extremely grateful for our friends and allies that have shown support to our center. We will ONLY get bigger and stronger!